You could produce this from any production prop, but we will presume you are going to produce this from an empty hat. The magician displays an empty hat and says he is going to produce a rabbit. He reaches into the hat and produces a silk. 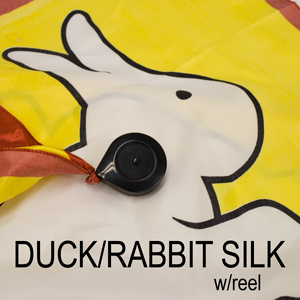 With a comment to the effect that the rabbit must have got pressed flat when he sent his hat for cleaning, he opens the silk to display the picture of a duck. Flabbergasted for a moment, he simply brings two corners of the silk together, and when he opens the silk again, the picture of the duck has now changed to a rabbit. Large 20 In. size in four colors.